USDA's Natural Resources Conservation Service brings soil health to a young audience. USDA’s Natural Resources Conservation Service brings soil health to a young audience. There’s a time, usually when Planet Earth is teetering on the brink of destruction, that humankind looks for a superhero to emerge from the shadows. These characters arrive larger than life, usually in a blaze of glory and a gaudy costume, just in time to save the day. There’s a new superhero who has emerged recently, but this one shuns the spotlight. She’s also one of the smallest creatures ever to be endowed with a set of superpowers. Mini Microbe. 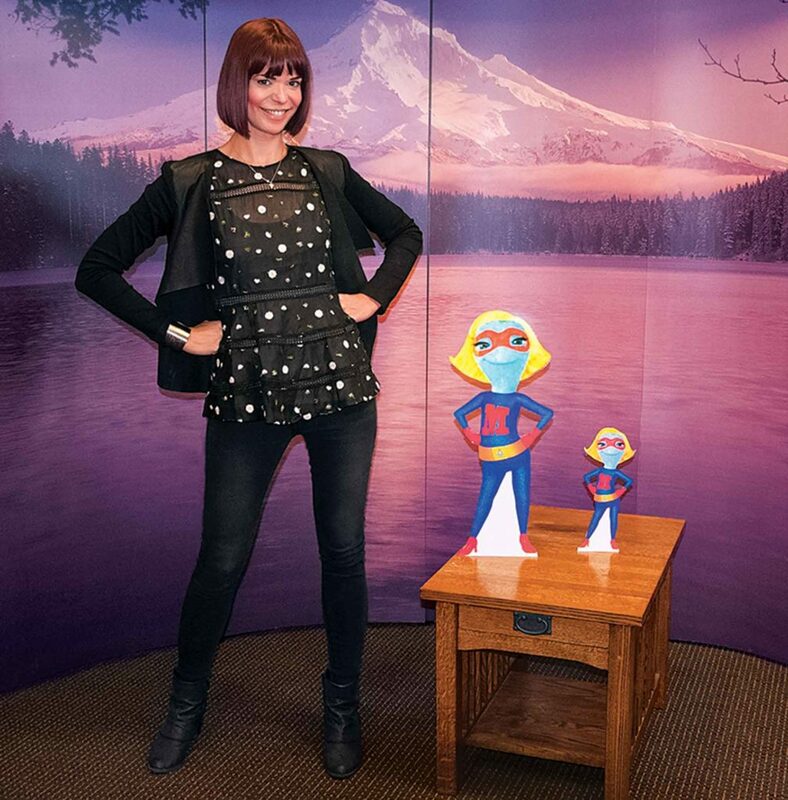 Introduced by the USDA’s Natural Resources Conservation Service, Mighty Mini Microbe is a comic-book hero—actually, to be precise, a coloring-book hero—whose real-life counterparts use their super powers every day to keep life humming on this planet. The agency recently introduced Mini in a 24-page coloring book, hoping to encourage the next generation of soil-health farmers, conservationists, and scientists as they further unlock secrets in the soil. “While the characters are fictional, there is solid science behind the narrative,” says Ron Nichols, author of the Mighty Mini Microbe’s Tale coloring book. Nichols also led NRCS soil health communication efforts before his recent retirement. Featuring spunky ‘microbe-itude,’ Cat Bailey’s superhero creation Mini Microbe stars in a coloring book with a soil-health message. Mini’s adventure is the latest installment in the USDA’s award-winning awareness and education campaign called Unlock the Secrets in the Soil. That campaign targets its messages not just to farmers, but to a broad consumer audience as well, reaching out with such things as Public Service Announcements on radio and television stations along with messages on billboards and other outdoor venues. While the PSA spots often are lighthearted, the message is serious. “Understanding the elegant symbiosis of our soil ecosystem may well be the key to our survival as a species on the planet,” Nichols emphasizes. Winning ways. The USDA’s “Secrets in the Soil” campaign has found an audience willing to learn about this often-overlooked resource. “We’ve been pleased with the response that our soil-health message has received at TV and radio stations across the country,” Nichols says. As of the beginning of 2018, USDA had received free broadcast exposure for its PSA announcements that exceeded $12 million in value, producing more than a billion total consumer impressions. The campaign has received some high accolades, including a 2017 Silver Anvil award from the Public Relations Society of America, recognizing the campaign with its highest honor in the public service category. 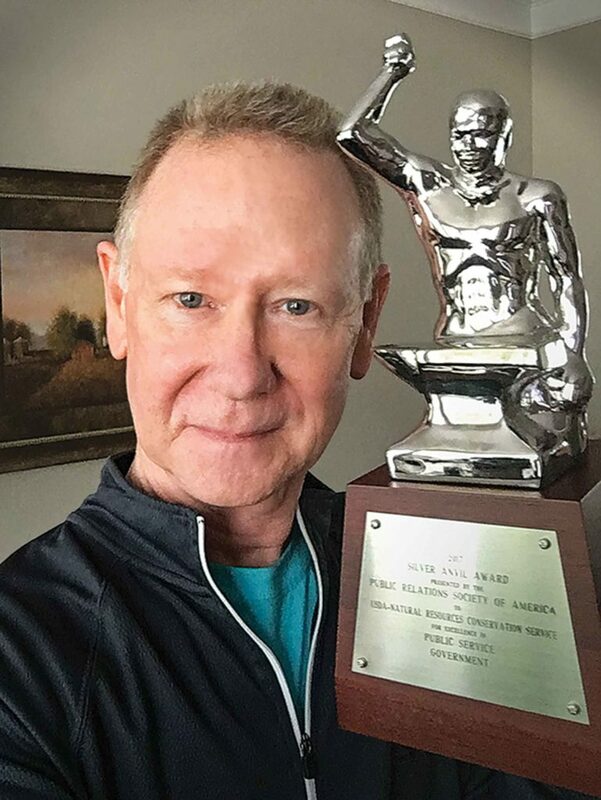 Ron Nichols displays the Silver Anvil awarded to the soil-health communications campaign. Mini’s message. In her coloring-book adventure, Mini Microbe speaks directly to kids (and their parents) about the super powers that microbes perform in the soils below. “Just because you can’t see us, doesn’t mean you don’t need us,” she reminds her readers. Mini points out that microbes can help protect plants from pests, make nutrients available to plants, and build soil so roots can go deep into the ground, where they are able to acquire the water that plants need. Reaching out. You can find Mini’s coloring book by visiting the NRCS website, nrcs.usda.gov; the site offers many resources to help young people learn more about soil superheroes. Nordic milk from Lac St. Jean has a taste of its own. Farmers share lessons from new practice.